The first thing many owners of historic properties decide is to replace their historic windows, due to perceived inefficiency. 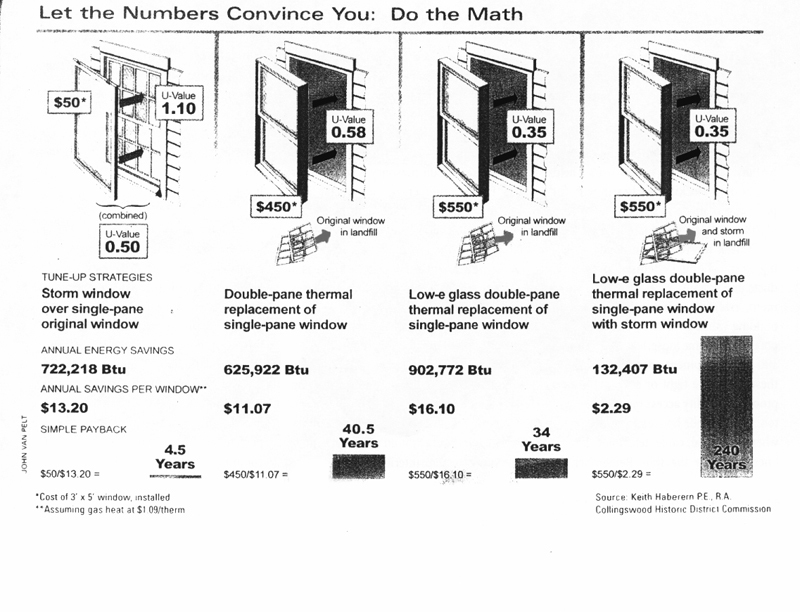 However, the graphic below illustrates that the payback on energy savings takes 10 to 50 times as long as simply adding a single pane storm window. Besides, why would you want to replace a window that has lasted over 50 years with one that will only last 20 years? Never mind that your historic property will be more valuable, and alot more attractive if you can repair and keep your historic windows by preserving them with a relatively inexpensive, and historically appropriate, storm window. The materials of historic windows represent the product of our nation's Old Growth forests (now mostly gone), and the craftsmanship is unlikely to be found in a modern replacement. Leave your historic windows in place, preserve and steward them for future generations to enjoy and appreciate.